WMPhoto is a new format for image compression that is said to have better quality/compression ratio than that of current standards, including JPEG 2000. 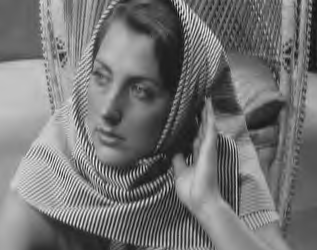 The main goal of this testing was the verification of superiority of WMPhoto by comparing it against nine JPEG 2000 codecs from last year's JPEG 2000 Image Codecs Comparison. PSNR is a metric used to compare two pictures: the more per pixel difference between the pictures is the less is PSNR value. 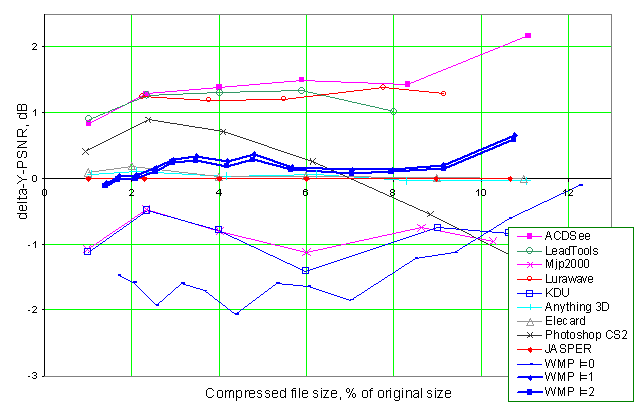 So the higher is the codec's line on the graph the better is the compression quality. PSNR was measured using the PRO version of MSU Video Quality Measurement Tool (with command line support). Y-PSNR is the difference in brightness component. There are three graphs for WMPhoto, they correspond to different values of overlapping parameter ("l"). Warning: this is only one of eight graphs from our comparison! All of them can be found in the PDF with comparison.. In most cases the PSNR value is in accordance with the compression quality. But sometimes this metric does not reflect presence of some important visual artefacts. For example, we can't estimate the quality of the blurring artefacts compensation performed by some codec using only PSNR metric. Also in some cases it is difficult to say whether 2 dB differens is significant or not. That is why in addition to PSNR graphs we use visual comparison of images compressed by different codecs. There are samples of images compressed by every codec in PDF with comparison . Download PDF (in ZIP, 4164 KB).